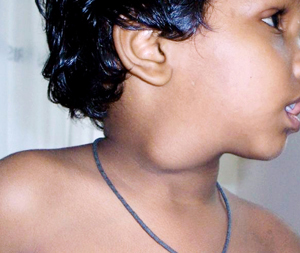 An eight year old boy was brought to me with neck swelling on right side of the neck. They already consulted many physicians and all advised their parents to undergo surgery. 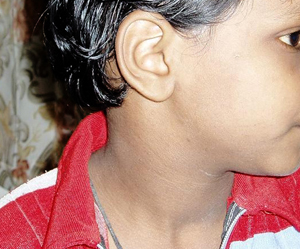 They were afraid of surgery and had finally chosen me for Homoeopathic help. I went through the case sheets and examined him. Additionally he had tendency to cold and cough, he had occasional fever. He was hale and healthy and immunized for various disease. His family history revealed no signioficant genetic diseases. The boy is thin, very dull, timid and lethargic . Weeping disposition for least things. Easily tired. Can not tolerate cold weather. His appetite, bowel habits were normal. Sweating was profuse over scalp . Sleep was normal. No significant dreams except day to day activities. Keeping these symptoms, I didn’t repertorised because of busy schedule, but prescribed Cal Carb 1M on 14-4-2003. Further follow ups at fortnight intervals, monthly intervals reduced the swelling within six months duration. The remedy was repeated only three times. Even after years the swelling has not recurred.. 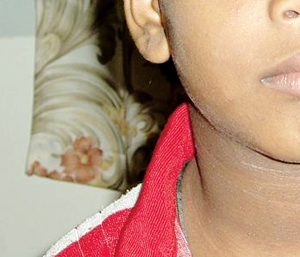 The photographs taken before and after are given here for clinical interpretation. 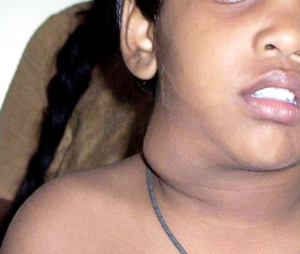 A usually spherical cyst, arising as an embryonic out-pouching of the foregut or trachea. It is generally found in the Mediastinum or lung and is usually asymptomatic unless it becomes infected. Bronchial cysts arise from time to time as a result of budding from the bronchial pathways during the process of development. Most of the bronchial branches are already formed by the fifteenth week of fetal life, but they continue to divide, reaching completion in about the eighth year of life. The cysts measure up to about 10 cm in diameter. Their walls are sometimes thin, comprising little more than connective tissue and bundles of smooth muscle. They may contain cartilage, mucous glands, and fibrous tissue. The existence of cartilage often distinguishes them from other. CT chest demonstrates cystic nature of the lesion and its close association to bronchial tree thus confirming the diagnosis.